In learning to create a self marketing company, I’ve made mistakes. In fact, I have made lots, and lots, and lots of mistakes. For example, you may have noticed in my recent podcast, I recently discovered that although I am not a perfectionist in the most sense when it comes to my business, I am a procrastinator and in ways, some of my tendencies hold me back. These tendencies help me procrastinate. Now, that’s another one of my faults and what I get wrong. I am an expert procrastinator. Personally, I think I am lazy. Now, most people when they see me, they say that I am not lazy. Honestly, I am a bit far too critical of myself. Therefore, as I do a lot of work, at the times I am not working, I feel I should be working. It’s at that point that I feel like I am procrastinating. However, one of the ways I get around that is by asking myself if this is something that one of my paid staff can do for me. I look at it this way — if it is something that my staff wants to do and would like to be paid to do, then maybe I shouldn’t be doing it. It’s a merry go round in my head and it keeps me busy! What else do I get wrong? I am not good at dealing with people problems. I like it when everything goes smoothly. I would rather delegate that task to someone else better suited to dealing with issues and problems that customers might have. If I do it, I quite often get it wrong. It’s not necessarily that I don’t want to do it, but it’s my business and I have to man up and do it if it’s got to be done, but quite often I don’t do it the way that it should be done and I get it wrong. I don’t do it in a bad way, but I try to be too nice, and then I sometimes upset people and give them the wrong impression. That is something I get wrong, but I am aware of it, so I delegate it to one of my staff members. Another thing I get wrong is working on too many projects at one time. So if I have 10 projects on my to do list, I am not going to be able to focus on any of them. I work on getting things done all the time and it is a major subject for the small business owner, and recently, what I have learned is to write down up to 10 projects you have going on. Now when I say up to 10, you and I both understand that this means we both know that we normally have more than 10 projects on our lists at one time or another. If nothing ever gets completed off that project or to do list, they only get added to and get longer and longer and longer. It winds up being depressing and overwhelming to some. It will bring on depression, procrastination, feeling overwhelmed, etc. So what I have learned (thanks to Strategic Coach) is to write down 10 of the projects you are working on, then select 5 of those that you wrote down and start on those. Now, it makes you prioritize and when you prioritize, you are going to pick 5 that you feel are the most important to get done, and you will leave 5 that are not that important to get done. From this point, you can ask yourself about the ones that did not make it on your important list — are they important at all? Can you just remove them all together? Maybe you can move them to another list to be done at a later date. But for me, I think to myself — Just delete them. If they are that important, when you have completed the first 5, they will still be there and can be done when you need other things to accomplish. I now mainly base my projects on what is mainly going to bring in the money first. That’s what business is all about. Now, once I have those 5 projects, I can get something going. In all honesty, I should not be starting out with 5 projects either. I’m certainly not going to work on them all at the same time. Of that list, there might be something I can outsource or pass on to one of my team members, or at least part of the project so that it is ready for my portion and gets done quicker. If I can outsource the start, and then get on with something else, I am getting more done and then when they finish their portion, it is ready for me and gets completed quicker. I am making an effort to work on less things at once. That is going to move me forward. I’ve said before that if I can complete one project a week for myself, that is 4 a month — that’s almost 50 a year! 50 projects is definitely going to move me forward. We all have to learn how to be more patient. Are you patient? Despite me reciting to myself, “Slow and steady wins the race”, I am still impatient. If I think an idea is good right now, I want it right now. It’s like if I decide there is something in the store that I like, I don’t think — Oh I’ll wait a couple of month. No — I tell myself I want it right now. All of these faults, problems, and things I get wrong are also helping me to develop and learn to get better. My advice to you is what do YOU get wrong? Consider what you get wrong and consider what you have done to make it better. Can you make it better still? Is it something you need to work on? Is it something you need to improve? In which case, get yourself a mentor or get yourself a coach. Have someone from the outside who can look at you and talk to you, someone who is in business whom you respect, and can learn from. We all make mistakes, but they are part of the learning process. Don’t get over concerned. We are always improving. Just make sure you have someone to help you. It’s Thursday and that means it is time for a drive time podcast. 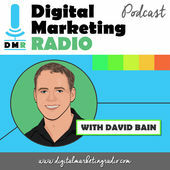 Today’s podcast is hosted by David Bain and is called Digital Marketing Radio. The guy is from Scotland and has a lovely accent — a Scottish accent you can understand. His show runs about 30 minutes and he has been doing them for a while now. His podcasts are great. He interviews people and he has a different take on his radio show than most. I love it when someone has a different take on how they do interviews. Go listen to David. Look him up on Itunes. If you like him, and you should, then give him a rating. 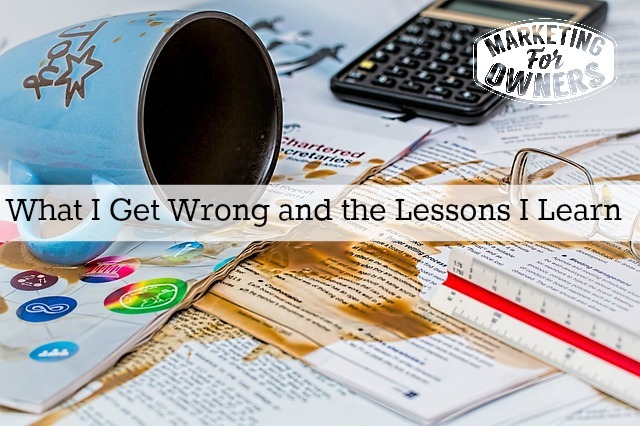 What have you learned from your mistakes recently?